The bulk carrier SARAH in Tilbury in Sept 1998. I have no other details RWJ. On the face of it just an average 1970s Panamax bulk carrier that was used in both the ore and grain trades. 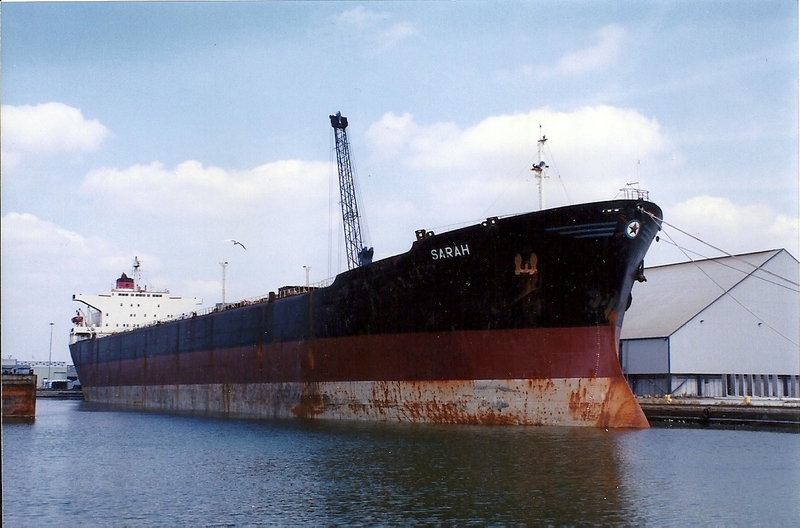 SARAH was built in Sunderland in 1976 at a time when Britain still had a shipbuilding industry … just! Launched as SUTJESKA, it was owned by the government-controlled Jugoslavenska Oceanska Plovidba (Jugooceanija), which was based at the picturesque port of Kotor in Montenegro province of the then Yugoslavia. At 38,237 tons gross, and 72,149 deadweight, SUTJESKA voyaged under that name until 1993, when its owners decided to set up Ocean Lines Co Ltd, of Malta, specifically as registered owner of the vessel, which was renamed SARAH. All was not well with Jugooceanija; it was heavily in debt (including $9 million owed to Lloyds Bank), it was suffering from poor trading results and it was costing a lot to keep the company ticking over. And of course, political and civil unrest in the various bits of Yugoslavia were not helping. All of the dozen or so ships owned by the company were transferred out of Yugoslavia, while control was retained, and they were then gradually sold off mainly to satisfy increasing debts. When Jack took this photo SARAH was laid up in Tilbury, but its lay-up did not last long and soon after it was off to Buenos Aires to load grain destined for Rotterdam. 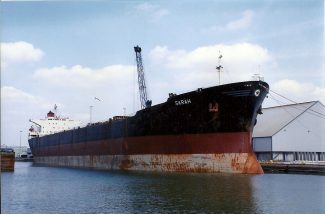 Its last voyage was early in 2001, when it went to Bangladesh to be scrapped. As for Jugooceanija, which had its origins in the 1890s, it sold its last ship in 2006 at around the time when Montenegro secured full independence from Bosnia. If you happen to be in Kotor, and find the maritime museum, look out for a large model of this ship. One of several models on display, it was presented in 1976 to the owners by the shipbuilders in Sunderland.